The Moses® appliance has been shown to be an effective oral airway dilator available for dentists to use in the treatment of obstructive sleep apnea (OSA). By incorporating tongue management, the Moses® appliance has improved on the effectiveness of simple mandibular advancement splints. 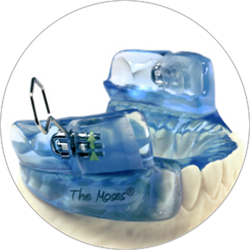 The Moses® appliance has been shown to facilitate reflexes that advance the tongue, lower elevator muscle activity, reduce clenching and decrease bruxism. The two part design is very comfortable, allowing the patient to close their lips, talk and even sip water. This new, innovative device adds another dimension to oral-appliance therapy. An open anterior design combined with mandibular advancement protrudes the tongue and enlarges the airway. In addition, patients are able to talk, drink, open wide, and close their lips with the appliance in place. The Moses® Elite was recently introduced as an alternative for bruxer patients. The Visiclear base is strong and flexible offering increased tongue space in a sleek design. The Moses® Elite also has the added benefit of in-office vertical adjustment. Separate flexible retainer to prevent tooth movement. Ideally designed to determine mandible protrusion, pre-set according to your bite registration. Reduces clenching, decreases or prevents bruxism. Buccal-mounted advancement screws allow for an open anterior space for the tongue. The base of the device is specifically designed with acrylic guides that stimulate the tongue to a protrusive or anterior position. Elevates tongue to the hard palate and increases nasal air flow. Prevents collapse of the tongue on the pharynx. Patients can easily talk, drink, open wide, and allows lip seal. Laboratory fabrication of The Moses® and the Moses® Elite appliances involves a preliminary step to block out all undercuts (both hard and soft tissue) before the appliance is processed. Generally, both appliances can be inserted immediately but occasionally slight adjustments are needed. A colored disclosing indicator such as Occlude® by Pascal Co., Inc. is sprayed on the interior surfaces where the appliance would contact teeth and tissue. Where there is an interference the colored indicator spray is removed. Interferences are removed with a small egg-shaped acrylic bur on a slow speed handpiece. It is very important that patients be able to easily and smoothly insert and remove the appliance by themselves. Patients should be carefully queried to make sure the appliance is not irritating their soft tissue before they leave and are instructed to come in immediately for adjustment if they develop a sore spot, jaw pain or sore teeth. The Moses® and the Moses® Elite appliances have an advancement screws on each side of the appliance for mandibular advancement. Each turn of these screws from bar to bar advances the mandible approximately 1/8 mm. Six millimeters of anterior movement is possible. Dr. Moses advances very conservatively; four to six turns of the key at two to three week intervals until the patient reaches maximum medical improvement. In the rare occurrence that the patient experiences facial pain or jaw pain, it is recommended to advance just a few turns of the key on the side of the pain to stretch and calm the muscles. which is more flexible and stronger than methyl methacrylate. the maxillary retainer. Methyl methacrylate does not bond to Visiclear®. To order a Moses appliance for your patients, simply contact an authorized MicroDental network lab near you for more information. For more information and requests, please email to info@microdental.com.